Are these not the cutest things ever? Baby girl loves watermelon just like her momma so for her first birthday party I wanted to figure out a way to serve watermelon salad on a stick. It was quite the conundrum as I couldn’t find any examples of what I had in my mind. I even had the Market Street cheese specialist asking me for pictures of it once I figured it out. I am now OBSESSED – both with how sweet they look and at what a perfect little app they make! One seedless watermelon. Side note: if you’ve never cut a watermelon it’s really easy! I was very intimidated the first time too but check out this video and get to cutting. It’s WAY cheaper than buying pre-cut watermelon and you’ll get MUCH more goodness! Take a potato peel and half peel your cucumber so there is an every-other-strip of skin, no skin, skin, etc. Slice cucumber into about 1/8″ slices and set aside. 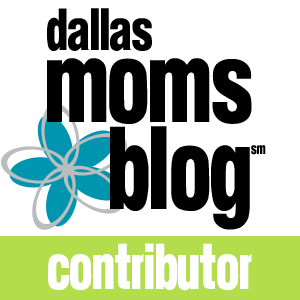 This will act as the base of your app. Cut your watermelon into small cubes that will fit onto the cucumber face and set aside. Grab your cheese, mint & toothpicks. Carefully cut the goat cheese log into slices. It may begin to crumble and that’s ok.
Use your clean hands or butter knife to spread/stick cheese to one side of the cucumber. 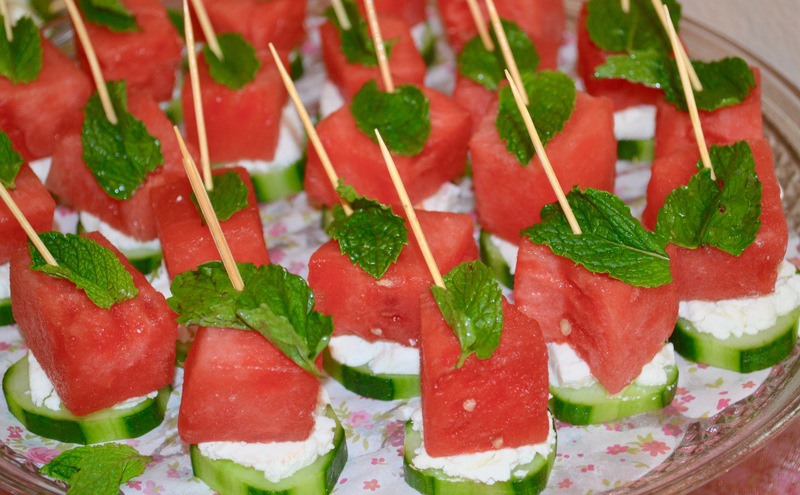 Stack a watermelon cube and then mint leaf & put toothpick through at a slight angle until it hits your serving platter. Continue with all desired pieces. Just before serving, spray or sprinkle dressing on top. 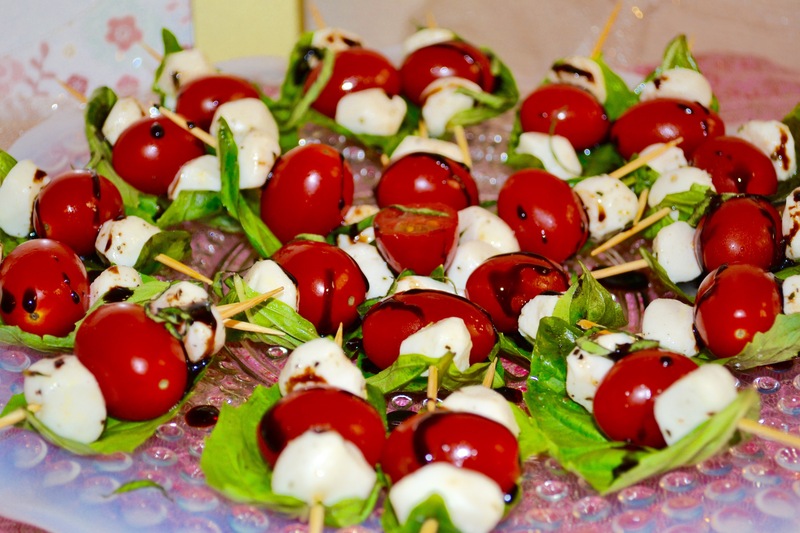 An oldie but a goodie – the caprese on a stick trick. I must say, I’ve had these a ton of times but I really loved how my mom assembled these cuties using the basil as a boat for the balsamic glaze goodness! If you’ve never tried these before they are the perfect thing to throw together last-minute for a game night or quick snack for the kids. If your mozzarella balls are not already marinated, dump them into a small bowl and marinate in the 1 tbsp olive oil & 1 1/2tsp Italian seasoning for at least 30 mins. To assemble, start with toothpick going through one edge of the basil and if the leaf is large enough add one of the mozzarellas followed by tomato, another mozzarella and through the other end of the basil. If basil is not large enough for two of the cheese, just go with one – you’ll still get all of the flavor components in there. Just before serving, drizzle with balsamic glaze (I prefer a heavy drizzle :)) and lightly sprinkle with salt and pepper. If you’ve never watched Haylie Duff’s The Real Girl’s Kitchen you should. She’s got some really clever ideas and it’s an entertaining show. 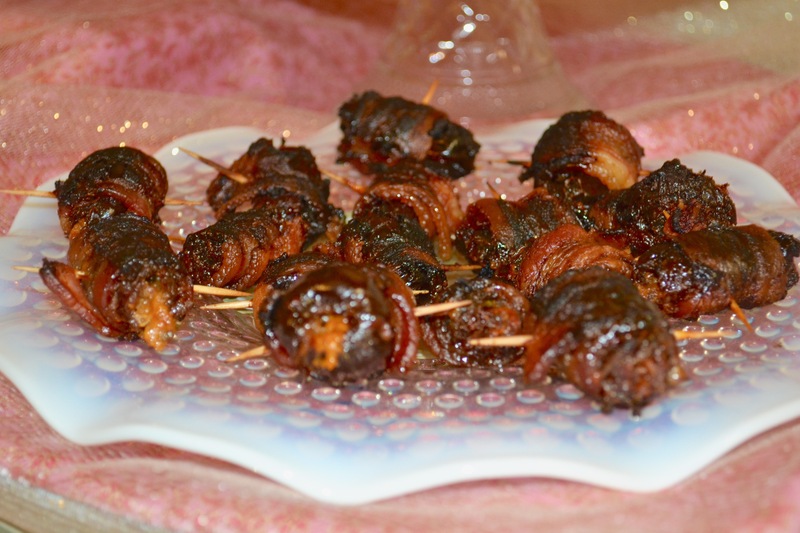 A while back I saw her do these bacon wrapped, blue cheese stuffed dates and I filed it into my memory to do as a party app one day. THEY ARE AMAZING. The dates have this sweetness to them that combined with the creamy blue cheese and salty bacon will blow. your. mind. Take a small, sharp knife and start with it in the middle opening of the date. Cut down about halfway on one side and gently squeez so the hole opens a bit. Complete with all the dates and set aside. Now is a good time to preheat your oven to 375 & prep your baking sheet with either parchment paper or foil. Get your blue cheese and a small spoon and get to stuffing those dates! Use your fingers to press the blue cheese to the bottom of the date and fill it on up. Repeat with all dates. Get your toothpicks out and grab that bacon. Start your date at one end of the bacon so that the opening is open to the outsides of the bacon and press down a bit. Slowly roll and continue to press into bacon until the bacon overlaps by about 1/2″. At this point you can cut the bacon and insert your toothpick completely through and place on your baking sheet. Pop them in the oven for about 15-20 mins (until browned) and then flip over for the same 15-20 mins until completely browned.